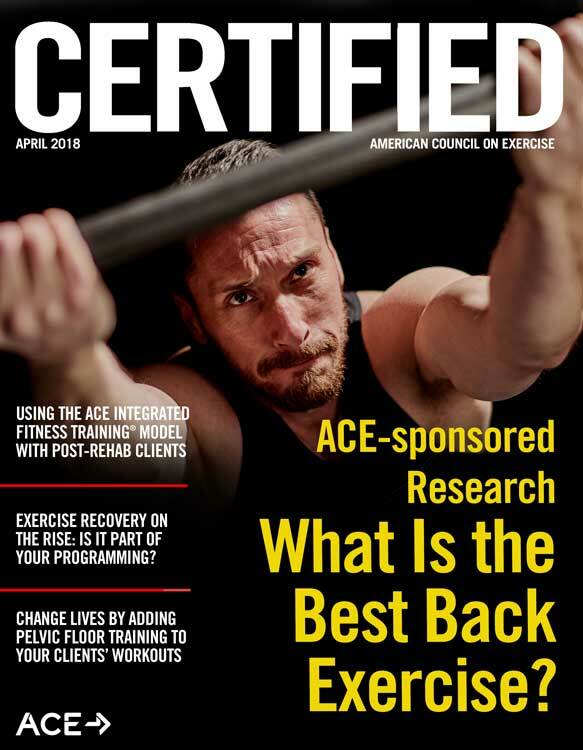 ACE - Certified™: April 2018 - ACE-SPONSORED RESEARCH: What Is the Best Back Exercise? Training the muscles of the back is a complicated endeavor, as evidenced by the number of exercise machines designed to address this region of the body. From the lat pull-down and back extension machines to pull-up bars and free weights, the options seem endless. Of course, there is good reason for this, as the muscles of the back vary tremendously in terms of their functions and angles of contraction. Consider the five muscles evaluated for this study, which are listed below along with their primary functions. The research team chose these muscles for a couple of specific reasons. First, they wanted to evaluate muscles from the top to the lower part of the back. They also wanted to avoid “cross talk” between muscles, which occurs when the signal from one muscle interferes with the signal of another due to the layering aspect of the back muscles. Clearly, it would challenging to effectively work all of these muscles simultaneously with a single exercise. That said, most of your clients are undoubtedly looking to maximize their time at the gym. 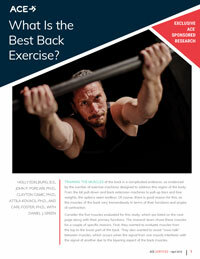 To gain a better understanding of how to best target the muscles of the back with as few exercises as possible, ACE enlisted the help of John Porcari, Ph.D., and his team of researchers in the Department of Exercise and Sport Science at the University of Wisconsin–La Crosse. For this study, the research team recruited 19 apparently healthy males between the ages of 18 and 25 years old (Table 1). They all had previous resistance-training experience and were familiar with the exercises included in this study. During the first of two sessions, the participants practiced each of the eight exercises described below. For four of the exercises—lat pull-down, bent-over row, seated row and I-Y-T raises—a one-repetition maximum (1-RM) was determined for each participant. The other exercises utilize body weight as resistance, so finding a 1-RM was not appropriate. 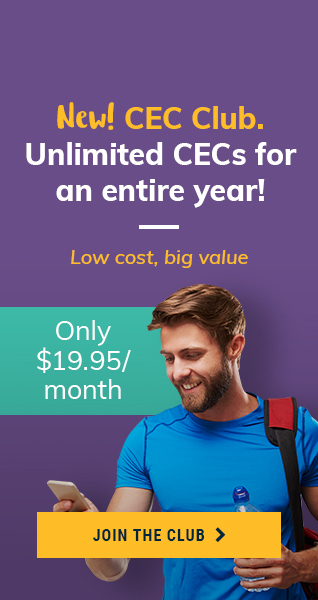 A minimum of 48 hours later, the subjects completed one testing session, which began with a recording of their maximal voluntary contractions (MVC) at each of the five muscles being tested. This was done by placing electrodes on each muscle and taking electromyography (EMG) measurements. Electrodes were placed on these same muscles during the performance of each of the exercises to compare muscle activity to each participant’s MVC with each muscle. The testing session consisted of performing the following eight exercises in a randomly assigned order, using either 70% of 1-RM or body weight. The participants performed five repetitions of each exercise and rested for two minutes between sets. Lat pull-down: The subject sat in the machine with his thighs under the pads. He then grasped the bar with the hands slightly wider than shoulder-width apart, palms facing forward and thumbs wrapped around the bar. With the elbows straight overhead, the subject pulled his shoulder blades down and back. 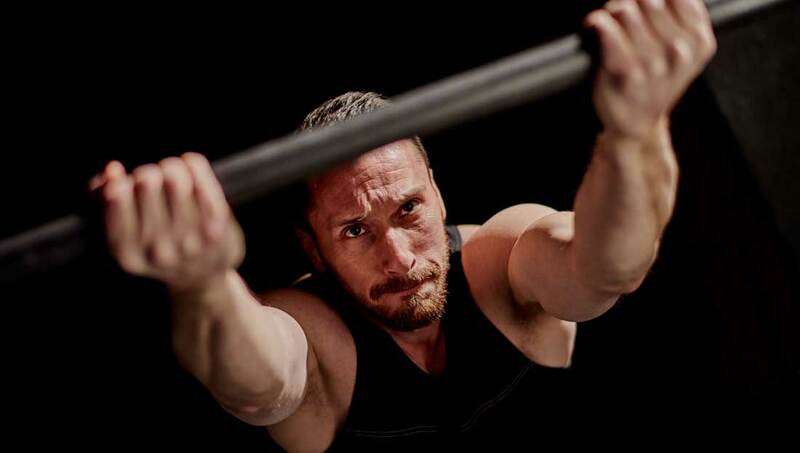 The subject leaned back slightly and pulled the bar down to the top of his chest and paused. To finish, the subject slowly straightened the elbows and returned the bar to the starting position. Seated row: The subject used a seated pulley cable machine and a v-bar handle. The subject placed his feet on the platform with the knees bent and maintained a straight back. He then grasped the handle and lifted the chest, while slowly pulling the elbows backward until the handle touched the front of the stomach. To finish, the subject paused for one second before slowly straightening his arms to return the weight to the original starting position. Bent-over row: The subject gripped a barbell with the palms facing down so that the wrists, elbows and shoulders were in a straight line. The subject lifted the bar from the rack, bent forward at the hips, and kept his back straight with a slight bend in the knees. The subject then lowered the bar toward the floor until the elbows were completely straight. He then pulled toward the sternum while keeping a flat back. To finish, the subject slowly lowered the bar to the starting position. Inverted row: The subject had a wider-than-shoulder-width grip on a bar positioned on a rack at about waist height. The subject hung underneath the bar with his body straight, heels on the floor and arms fully extended. He then flexed his elbows, pulling the chest toward the bar with the shoulder blades retracted. The subject paused at the top of the motion and then slowly extended the elbows and returned to starting position. Pull-up: The subject stood under the chin-up bar with arms overhead and palms facing away from him. The subject reached or jumped to grasp the bar firmly with a full grip position (thumbs wrapped around the handles). The wrists were in a straight line with the forearms (neutral). The subject pulled his shoulders back and down, bending his elbows to pull his body upward, keeping the elbows down toward his sides. The subject pulled until the chin was level with the bar. To finish, the subject returned, in a slow and controlled manner, to the starting position by allowing the elbows to fully straighten. Chin-up: The subject stood under the chin-up bar with his arms overhead and palms facing toward him. The subject reached or jumped to grasp the bar firmly with a full grip position (thumbs wrapped around the handles). The wrists were in a straight line with the forearms (neutral). The subject pulled his shoulders back and down, bending the elbows to pull the body upward, keeping his elbows down toward his sides. He then pulled until the chin was level with the bar. To finish, the subject returned, in a slow and controlled manner, to the starting position by allowing the elbows to fully straighten. TRX row: The subject held the TRX handles in each hand and faced the anchor point. The subject stood with one foot ahead of the other and both feet facing forward. He then pulled his shoulder blades down and back and gently leaned backward. The subject shifted his body weight over the back leg while straightening the elbows, which were positioned at chest height. He maintained straight wrists and kept his palms facing inward. The subject then bent his elbows and pulled his body toward the hands. His elbows moved toward his sides and remained close to the body, keeping the wrists in the neutral position. To finish, the subject lowered his body back toward the starting position, extending (straightening) the elbows without having the shoulders roll forward. I-Y-T raises: The subject laid on his stomach on a bench and extended the arms straight down toward the ground, with the palms facing inward. To form the letter “I” (arms straight overhead), the subject lifted his arms toward the ceiling and then slowly lowered them back toward the ground. The subject then formed the letter “Y” (arms at a 45-degree angle), lifting the thumbs toward the ceiling. He lifted and squeezed the shoulder blades together in back and slowly lowered the arms back to the starting position. To finish, the subject formed the letter “T” (arms at a 90-degree angle) by turning the palms toward the floor, and again lifted the arms out to the side by squeezing the shoulder blades together. He then returned to the starting position. Middle trapezius (Figure 1): The four exercises that best recruited this muscle were the bent-over row, inverted row, seated row and I-Y-T raises. 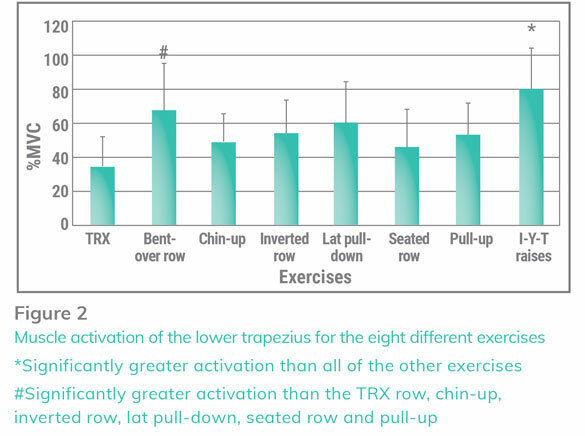 Lower trapezius (Figure 2): The I-Y-T raises outperformed all other exercises when it came to targeting the lower trapezius. The bent-over row was also significantly better than the other six exercises tested. 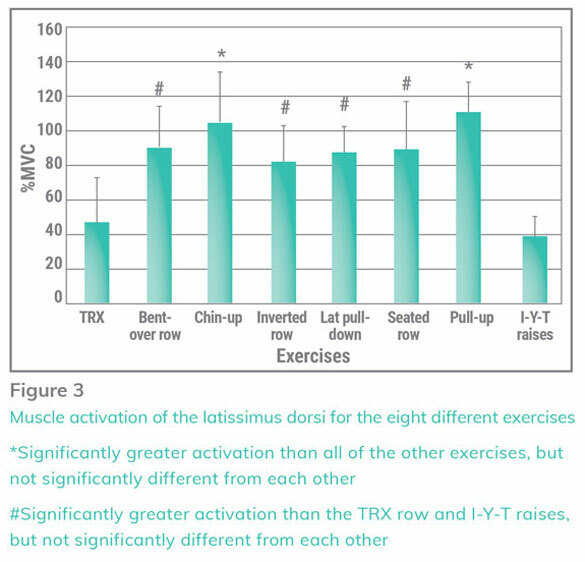 Latissimus dorsi (Figure 3): The pull-up and chin-up had significantly greater muscle activation than the other six exercises. The bent-over row, inverted row, lat pull-down and seated row also tested relatively well. 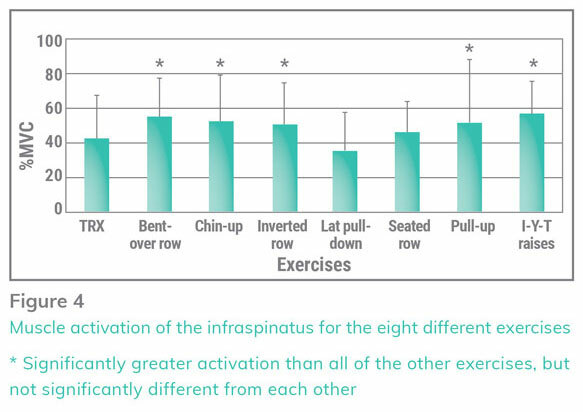 Infraspinatus (Figure 4): The I-Y-T raises, inverted row, bent-over row, chin-up and pull-up proved best at targeting the infraspinatus. Erector spinae (Figure 5): The bent-over row proved to be best at targeting the erector spinae. The results of this study indicate that there isn’t one specific exercise that best activates all five muscles tested to the greatest degree. 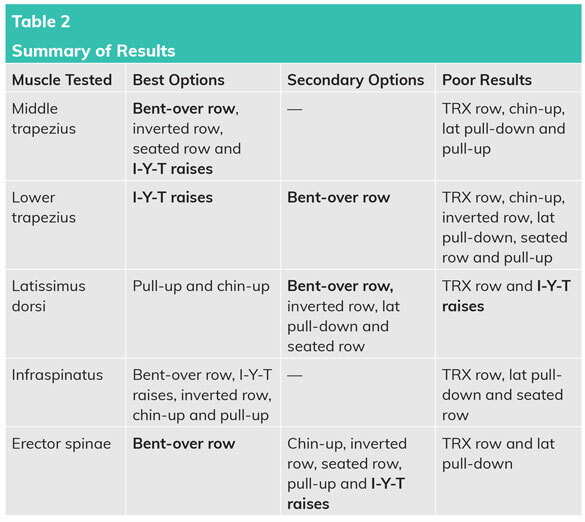 According to Dr. Porcari, if a person had to choose one exercise, the bent-over row would be the best option, as it activated three of the five back muscles to the greatest degree and was the second best exercise for the other two muscles (Table 2). If a client has the time available, the top two exercises to include in an exercise routine would be the bent-over row and the I-Y-T raises, which had the greatest activation in three of the five muscles and was the second best in one of the muscles. If wanting to specifically work the latissimus dorsi, the exercises of choice would be chin-ups and pull-ups. These findings support the notion that individuals will need to use a variety of exercises to train the entire back effectively. 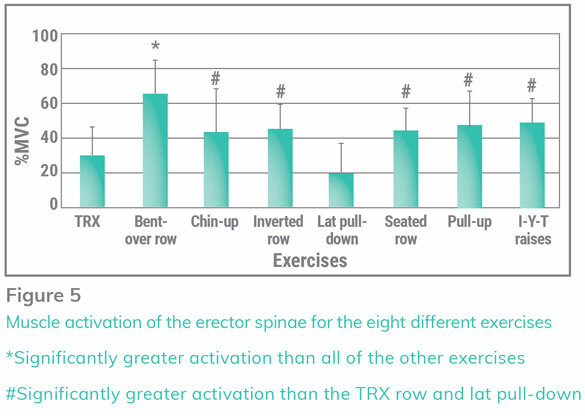 It might surprise some readers to see that TRX rows were outperformed by the other exercises tested in terms of muscle activation. However, it is important to note that suspension trainers like the TRX offer benefits far beyond muscle strengthening, including whole-body balance and stability training, as well as the development of accessory muscles. All of these elements should be addressed in a well-rounded exercise regimen. Dr. Porcari also points out that individuals seem to activate and recruit muscles differently. For some subjects, a certain exercise would activate a muscle to the greatest degree, while for others it would have low activation of that same muscle. For example, the lat pull-down’s name itself indicates that it should activate the latissimus dorsi, but with some subjects it was one of the least activated muscles when performing that particular exercise. These findings may indicate the importance of an individual mentally focusing on the particular muscle he or she wants to work. Another reason for discrepancy between individuals could be due to the anatomy of the body, as some people have naturally larger, more dominant muscle groups. 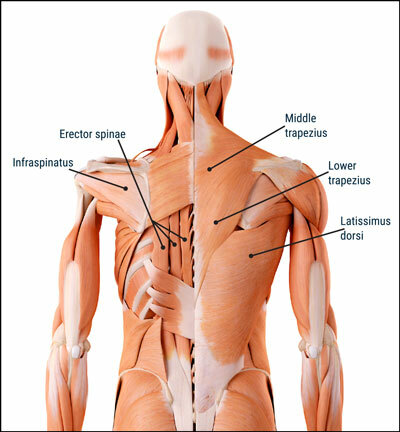 Which of the following is NOT one of the muscles that were evaluated in this study? The testing session consisted of performing eight exercises in a randomly assigned order, using either __________ of 1-RM or body weight. Which four exercises best recruited the middle trapezius? 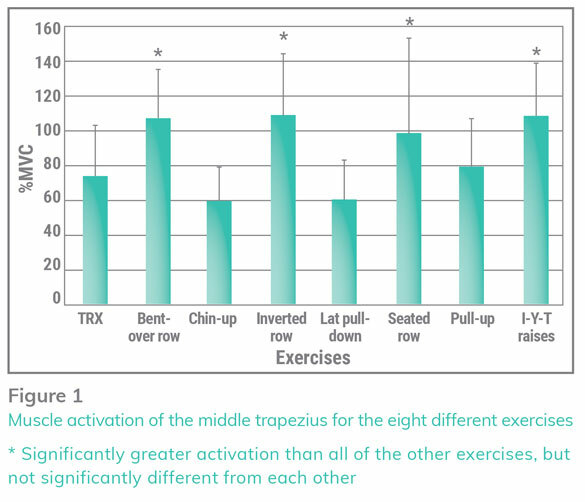 Which exercise outperformed all other exercises when it came to targeting the lower trapezius?